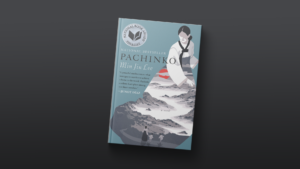 Our July pick for the PBS NewsHour-New York Times book club, “Now Read This” is Min Jin Lee’s historical novel “Pachinko.” Become a member of the book club by joining our Facebook group, or by signing up to our newsletter. Learn more about the book club here. So begins a family saga of four generations of ethnic Koreans who migrate to Japan and to whom history is not always kind. And yet each generation perseveres, enduring the oppression of Japanese colonialism and finding their way the best they can. Below, Lee annotates the first page of “Pachinko.” In her annotations, she explains why she chose that as the book’s opening line, how she finds her ideas, and what she was thinking as she wrote. At the turn of the century, an aging fisherman and his wife decided to take in lodgers for extra money. Both were born and raised in the fishing village of Yeongdo—a five-mile-wide islet beside the port city of Busan. In their long marriage, the wife gave birth to three sons, but only Hoonie, the eldest and the weakest one, survived. Hoonie was born with a cleft palate and a twisted foot; he was, however, endowed with hefty shoulders, a squat build, and a golden complexion. Even as a young man, he retained the mild, thoughtful temperament he’d had as a child. When Hoonie covered his misshapen mouth with his hands, something he did out of habit meeting strangers, he resembled his nice-looking father, both having the same large, smiling eyes. Inky eyebrows graced his broad forehead, perpetually tanned from outdoor work. Like his parents, Hoonie was not a nimble talker, and some made the mistake of thinking that because he could not speak quickly there was something wrong with his mind, but that was not true. In 1910, when Hoonie was twenty-seven years old, Japan annexed Korea. The fisherman and his wife, thrifty and hardy peasants, refused to be distracted by the country’s incompetent aristocrats and corrupt rulers, who had lost their nation to thieves. When the rent for their house was raised again, the couple moved out of their bedroom and slept in the anteroom near the kitchen to increase the number of lodgers.